I realized recently that J’s been asking to make what she calls “fruit pizza” for approximately forever. Okay, not really, but she’s been asking about once every three weeks for at least 6 months. Which is an awfully long time when you’re little. 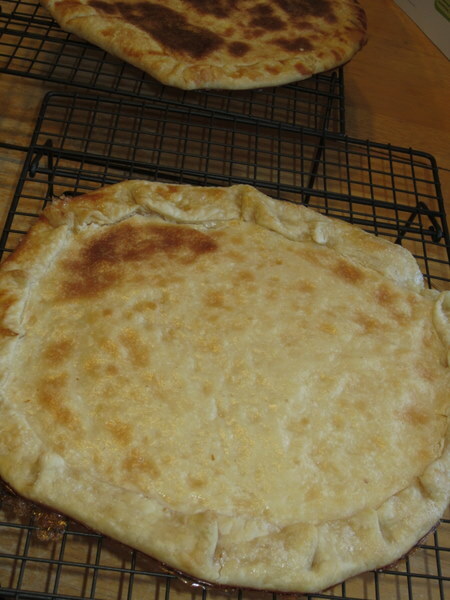 It’s a recipe called “Viva Les Galettes” from the Southern Living Kids Cookbook, which we also used for a couple of Halloween recipes. The picture was pretty, but I wasn’t convinced that we’d eat it all, since only Cute W is a big fruity dessert person in our family. So we made the recipe (which was two fruit pizzas) before the Super Bowl so that we could bring one to share with friends. Lucky for me, someone else already took the trouble to type in the recipe. You can check it there. But basically, we mixed a block of cream cheese together with a can of sweetened condensed milk. First of all, that was yummy. It tasted very much like that sweet fruit dip that they sell in grocery stores which I refuse to purchase on principle because fruit is sweet and does not need a fruit dip. However, I will concede that it’s yummy. 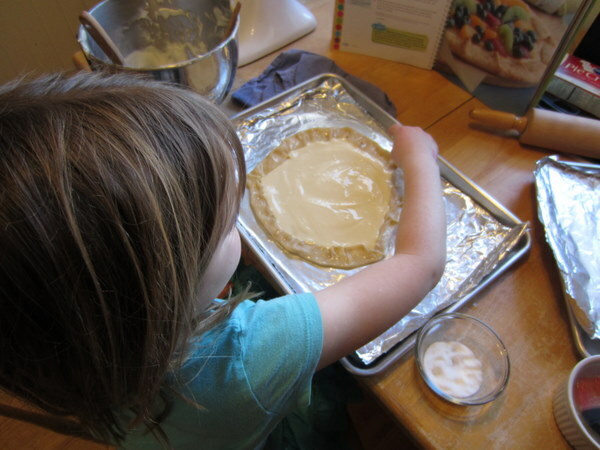 It was good as-is, but we spread the filling over the center of a pie crust, folded the outer inch inward, and brushed the outer edge with egg white and sprinkled it with sugar. We baked it for exactly 23 minutes as they said in the recipe, but they were a bit overdone. Usually I check early, because I think our oven’s a little too hot. But I got distracted. Still, not too bad. J loved cutting up fruit. 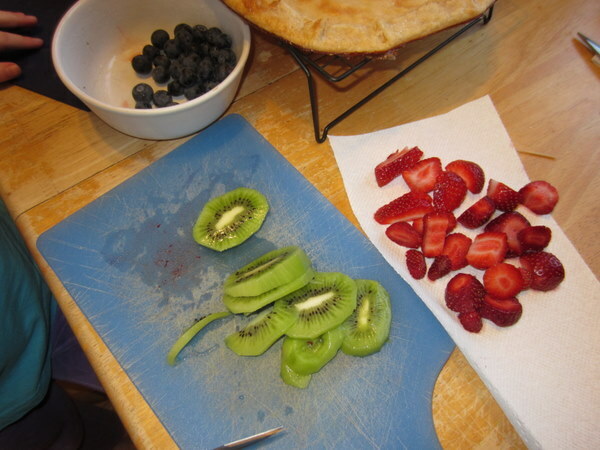 J wanted to cut the fruit herself, and I gave her a small but very sharp paring knife. It made me nervous, but she was careful. Kids tend to be much more careful with knives than adults, I think, because using them is such a special occasion. The recipe called for peach fruit spread, and we went with cherry jam instead, because that’s what we had. After putting the fruit on, it’s just refrigerated. The verdict? It was pretty tasty, and one of the guests at the party where we shared it pronounced it “very elegant” before she found out it was prepared by a 7-year-old. This was also a great recipe in terms of plenty of hands-on activity for kids. Especially if you’re willing to let your child wield a knife! 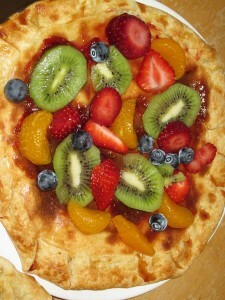 I see lot of fruit pizzas in our summer future! Thanks for sharing!! Yeah, it would be a lovely summer item. I just suddenly realized that poor J’s been asking since the summer and I was overwhelmed with remorse.